No, the title of this post is not something I stole from a menu from one of the many Korean eateries on W. 35th Street. It’s a profile of my son, Brian. No, he is not dreaming of traveling to France. No, he does not make a living balancing things on his forehead (maybe he does, maybe I missed something). And, no, he is not conjuring a suitcase. If he had that kind of talent, I’m confident he’d be conjuring something more interesting that a valise with faded travel stickers. We were at a restaurant just south of Macy’s and a few blocks from where he works. During the dinner I looked at him and recalled that I didn’t have a good profile picture of him. So I asked him to pose against a neutral wall, not considering the piece of old-time luggage that was mounted there. Before we rejected the desert menu, I was busy thinking. I had written many blog posts that highlighted places and people who I hardly knew. Interesting interactions with people who I, most likely, would never meet again. I’m proud of those posts, but it occurred to me that I had not highlighted my own children enough. I had mentioned them in many blogs, but never were they a main subject of my encounters. When I first moved to Manhattan in the very early 1990’s, Brian was about five years old. I was going through a divorce. My father brought him down to visit. I took my dad to Bethune Street where he worked for the Bell Labs in the 1930’s. Brian came along. He was a tiny guy in the big city. Later, he came down with a friend. I have a picture of him in front of the Twin Towers. He says he remembers the day clearly. Even later, he came to live with us while he attended Baruch College to complete his undergraduate degree. We had a challenging time fitting him into our one bedroom apartment on the Upper West Side. For me, it was good-bye Letterman while he slept on the fold-out sofa. He graduated and before you could say “congratulations”, he had a job. Now, he buys us dinner…we are the ‘out-of-town’ now. He tells me which train to take to get to some obscure place in one of the boroughs. He has a lady friend and they live in Astoria. Ironically, he lives just blocks away from where my wife grew up. I’m awed by how my son has grown up. I’m amazed at his success. I’m proud to have him as my son, my only son. No one will carry the Egan name into the future except him. And, I’m not pushing anything. I love my son beyond what I thought was possible. He is everything I tried to be in my life…funny, outgoing and charismatic. Where I failed, he succeeded. I hope the sweater is still in around somewhere. In a trunk maybe. Then someday, if he has a son of his own, he may be able to have him pose for a similar photo. And, maybe he’ll write a blog about much he loves his little boy. Oh, yes you are, my one son. My Number One Son. It was the day before the inauguration. I found a local gym that offered a month to month membership. No long-term contract. And, it was only$49 per month. Ok, there is no pool (I don’t like to swim anyway and ALL pools have water that, to me, is just above freezing. “Heated pools” …just a myth. And, I tend to get water in my ear which keeps me from hearing clearly and forces me to keep poking my forefinger in my ear to clear it out (it never works). And, there is no sauna in this gym, which is fine with me. My apartment is warm enough and I don’t really want to sit in a tiny room with a few older naked men. So I worked out on a bike for about an hour. Got my heart rate to about 107 and I left sweat on the arm rests. I had Spotify on my iPhone and was listening to some modern “Americana” music. Then I punched the “cool down” button. I had burned off several hundred calories which I was about to replace a block away at the Amsterdam Ale House. The woman had a sheet of paper. She asked if I would just say ‘who I was’ and what I was ‘fighting for’. I misunderstood what she said and thought that I would have my picture taken. I felt that I looked like Christopher Lloyd in Back to the Future. I needed a haircut and felt tired and miserable. A day later I walked into the theater lobby to go down to the gym. It was then that I saw the papers lining the walls. The papers I turned my back on. The sheets of paper that I had declined to write a phrase and a comment. As I read the sheets, I felt ashamed I didn’t have my own on the lobby wall. I left the gym that afternoon…not with sweat on my forehead …but with a tear on my cheek. What I am about to say might be familiar to some of my readers. These thoughts and descriptions appeared, in a slightly different form, in my book In The Middle of Somewhere. It was in the chapter that dealt with public bathrooms on a cross-country road trip in 2013. But, recent experiences during my very recent stay in New York City has prompted me to take to the keys and renew my war with a certain hand dryer…The Xlerator. It’s my opinion that this device (which I’m seeing in more and more restrooms) should be monitored by the FDA, OSHA and quite possibly NASA. In the name of “environmental awareness” i.e., “saving trees”, we are being subjected to a hand dryer that MUST exceed the regulations of decibels emitted by a small device. The dB’s are easily equal to that of a Boeing 747 as it prepares for takeoff…or a Who concert. It’s a know fact that the police can give a citation to anyone violating the dB’s in a particular area with a “boom box” or an unmuffled car (or motorcycle). So, where is the EPA in the men’s room? While in NYC last week, I happened to use the men’s room in the “Cellar”. This used to be a space for kitchen supplies and Godiva chocolates. Now it’s Mens Wear. More specifically, the underwear section of Mens Wear. When I left the bar in Rowland’s Restaurant to use the facility, I could hear the roar from as far away as Tommy Hilfiger. By the time I got to Calvin Klein, it was oppressive. When I took a left at Jockey, it was deafening. And I wasn’t even in the men’s room yet! So, without getting too specific, I emptied my bladder and, feeling the germs of public surfaces (I held onto the escalator to the lower level), I washed my hands. The only dryer available was the dreaded Xlerator. I hit the ON button. The roar and pitch was so great, I forgot my recent nightmares and concentrated on keeping my ears from bleeding. If that happened, it would present a whole new set of problems. I would need to go into a stall and get some toilet tissue to stem the blood flow from getting to the collar of my new shirt. (Besides, that would likely lead to minor hearing loss with damage to the stereocillia in my middle ear. I would then miss the subtle notes in a Metallica song). Not to mention the explaining I would have to do to onlookers. If you happen to come face to face with the Xlerator, I suggest cotton for the ears and finish drying your hands on your Guess jeans. Good luck if you’re wearing a family heirloom ring. God help you if you’re wearing a prosthetic finger. The force of the blast of hot air could launch a small dirigible, peel your finger nail polish past the nail itself and strip the paint off a ’57 Chevy. If you’re wearing a wedding ring, take it off before taking a whiz…but don’t forget to put it back on when you get back to the bar. Otherwise, your motives will be suspect. I only want clean hands, not an experience that might well leave me hairless on the backs of my skinless hands. Beware Product Development is out there and working on a better and more powerful hand dryer. God bless you, and good luck. Despite what my weather app informed me about this afternoon–that the temperature was heading toward the low 40’s, I’m still having the feeling that my wool jacket (more of a pea coat) is merely for show. The cold wind slices through me like a Triscut dips through Roasted Red Pepper and Garlic Hummus. I’m chilled through four layers of silk, fleece, wool and thick cotton flannel. There’s no cold like New York City cold on the second day of March. Spring may be three weeks away on the calendar, but it’s ten thousand miles from where I stand waiting for the M3 to take me down 5th Avenue to the Main Branch of the Public Library. To my back is the Plaza Hotel and behind my left shoulder is Central Park. Perhaps that’s the source of the cold wind? The snow-covered Great Lawn? 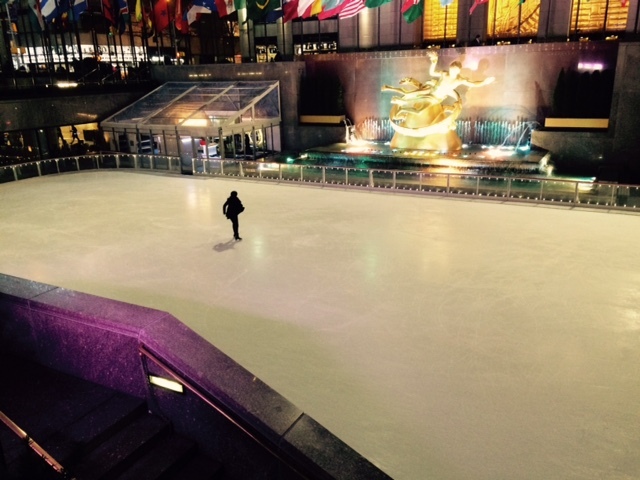 The ice of Wollman Rink? I consider this. A holding cell at a mid-town precinct has got to be warm. Here’s the M3. I’m saved from having to make any decisions. I’m going to a special place in a heated bus. I step off the coach into several inches of slush from last night’s snow fall. I push past the tourists. I’m standing on the third step of the library. 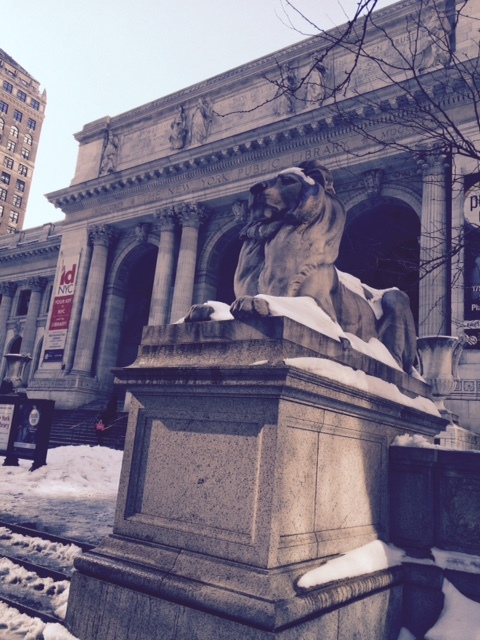 I climb the partially shoveled stone steps, passing between the two lions that guard this monument to culture. The lions are named Patience and Fortitude. Someone told me that they were named by Mayor La Guardia in the 1940’s. The point being that in those trying and harsh times (WWII), those are the virtues that all good New Yorker’s need. I didn’t have time to fact-check this (when he was the mayor) but the pamphlet says they acquired their names in the 1940’s so I’m going with that version. 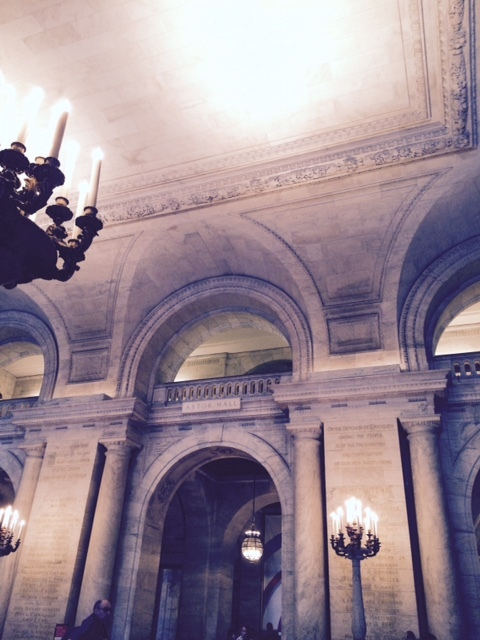 I push through the revolving doors and find myself in the Astor Hall. The architect who built this must have had access to unlimited white marble, for that is what I see everywhere I look. On either side of the great room, sweeping staircases takes me up to the second floor. 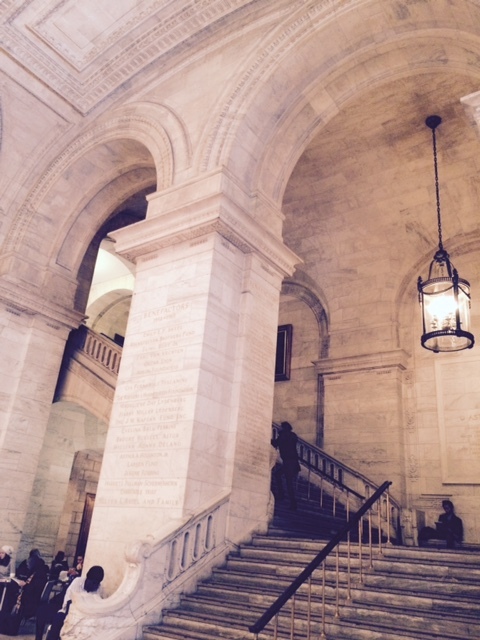 I slowly climb the steps, sliding my hand along the foot wide marble railing. What famous author had his or her hands on this stone? I’m told that my favorite poet, Bob Dylan, came here to research the Civil War when he was writing a song called, Across The Green Mountains. Maybe his hand paused where I am pausing. Perhaps an atom of Bob is still embedded between the Calcium Carbonate molecules of the marble? Then it occurred to me that he probably took the elevator. I looked at the dark stains on the white stone. When I get to the top, I dig for my bottle of Purell. I make my way to one of the public reading rooms. [The world-famous Rose Reading Room has been closed for nearly a year. Apparently, part of the ceiling had fallen.] I can think of worse things that can fall on your head while you’re sitting in the famous room and reading a boring book. Like an idea for instance. But, I’m not here as a tourist. No, I am here to work on my novel. It’s going to be a ghost story. I plan on it being scary and tension-filled, like the half-time shows of the recent Super Bowls. And, this is where I can get inspiration. Most American writers of the last 50 years have been in these rooms. Literary ghosts must walk these halls. I’m sitting in an oak chair as I write this. Who once sat here? Norman Mailer? Scott Fitzgerald? Jane Smiley? Jennifer Egan? Yes, I’m sitting in an oak chair. The table is massive and also oak. There are four of these tables in this room (Room 217, if you ever make the trip. See the guy behind the glass partition who is in charge of research? I’m in the corner nearby.) I look around the room and see many laptops, each with a bright white apple glowing from the silver lid. Oh, there’s a Dell. Poor devil. I have a new MacBook Air and the battery life is 12 hours, but some of those less fortunate have older models. 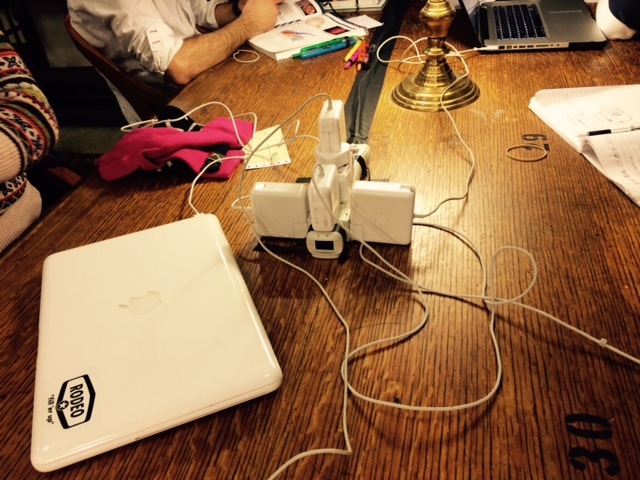 They need to feed their computers with juice, so the library had positioned power bars in the middle of each table. Some of these are so overloaded, I worry about an explosion. WiFi MAYHAM ON FIFTH AVENUE! I can see the Daily News headline now. I just hope I’m in the men’s room when it goes. I find my memory stick that holds all 13 of my completed chapters. It slides into the USB port like…(I could use a dirty metaphor here, but I do have some standards.) I’m going to write a frightening chapter. I need to concentrate on building tension. He’s right. I’m no Stephen King. I’m not John Steinbeck. I’m not even E. L. James. I begin to unplug my computer, when I realize that I have a 12 hour battery. I feel so independent. I must have patience. Good writing doesn’t come easily. Just ask Nora Roberts. No, I must plug along. And, I must have fortitude. I must kill the demon inside me that holds my fingers from typing a scene so scary that you will keep the lights on all night. My fingers return to the keyboard. I glance at the time display in the upper right hand corner. They’re going to close in a little over 30 minutes. Then I realize that I’ve spent all my time writing this blog. Now I have to pack up and walk back to the hotel on 28th Street. Only now, my load will be heavier, with all these words in the memory of my laptop. They were only in my head before I sat down. In a few minutes, I’ll head to the revolving door. I’ll pause to open my shoulder bag to show the security guard that I’m not taking the Gutenberg Bible or the Declaration of Independence. He knows me because I’ve been here before. He’ll wave me out and wish me a fine night. I’ll say the same to him. Then I’ll stand on the third step, between the two lions, facing the rush hour traffic of 5th Avenue. Maybe I’ll go behind the library and walk through Bryant Park. I’ll watch the ice skaters. I’ll try to turn my collar to the cold and damp. Music will be playing. I’ll put my ear buds in and listen to Townes Van Zandt. Or Iris Dement. Or Mary Gauthier. I’ll walk down 6th Avenue to 28th Street and go back to my hotel room. I’ll have a smile on my face as I walk and shiver, along the busy sidewalks. I’m smiling because this time tomorrow, I’ll be sitting by a pool in San Juan. The poolside, in the late afternoon, in Puerto Rico. Now, that’s a fine place to write a scary chapter. I’ll just need patience to stay out of the sun for a little while and fortitude to keep me from diving too often into the warm deep blue waters of the deep Caribbean.